In graduate school, I began my studies of geometry by reading a text by Porteous ([P]) and an article by Montaldi ([M3]). In his paper, Montaldi shows that a generic surface can have six circles with five point contact. He gives a specific example of such a surface by taking a generic perturbation of the above surface. A surface has the n-circle property if through every point of the surface there exists exactly n circles passing through the point and lying on the surface. So a sphere has the infinite circle property, and a torus of revolution has the 4-circle property. Blum [Bl], gave families of surfaces which had the n-circle property for n equal to 4, 5 or 6. Blum conjectured that there are no surfaces with the n-circle property for n greater than 6, less than infinity. 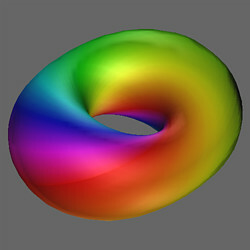 Montaldi's arguments show that such a surface must be a torus. 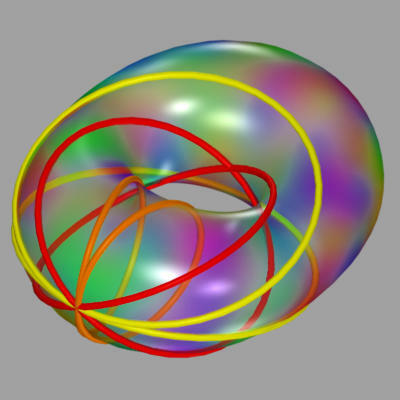 Takeuchi ([T]) used homotopy arguments to show a torus cannot have the n-circle property for n greater than 6. Combined, Blum's conjecture is proved. 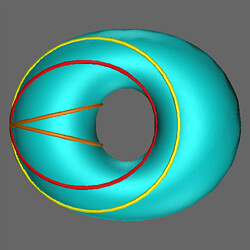 To prove that this cyclide has the 6-circle property, Blum inverted the surface with respect to a sphere centered at an arbitrary point on the surface. All circles going through this point are inverted into lines. 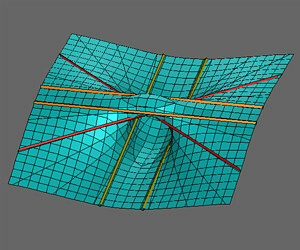 The equation for the surface turns into a cubic equation, and thus has 27 (complex) lines on it, counting multiplicity. It can be shown that 17 of these lines lie at infinity, and thus there can be at most 10 lines on the real portion of the surface. Through much computation, Blum shows that four of these lines are complex, and the other lines are real and distinct. The above surface after inversion. So, what about surfaces in higher dimensions? Does the extra freedom allow for more examples of the n-circle property? Most of the arguments depend on the fact we are looking at surfaces in R3. What will change in higher dimensions? 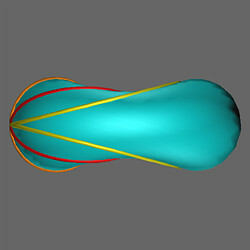 We have the standard Clifford torus, and really we have any example from R3 that is inverse stereographically projected onto S3. In addition, we have the self-intersecting sphere and the Veronese surface (which is a projective plane), both of which are covered with circles. We can also generalize by allowing isolated points to fail the circle property. 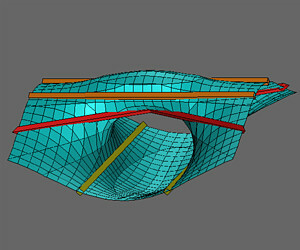 This would allow us to consider surfaces like ellipsoids. BACK to Dan's Research Page.